Frank De Boer- despite being hotly tipped as a big West Ham shout for manager – is not among the club’s front runners. The Ajax boss’ odds were slashed from 33/1 to 9/1 today as fresh stories emerged that he was very much in line for talks with the Irons. But club insiders have revealed the 45 year old is seen as as a gamble given that the Dutch League is among the weakest in Europe. Admitting there was an interest, our source revealed added that it would be “entirely wrong” to put him among the front runners. 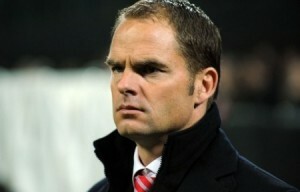 However, despite the reservations, de Boer hasn’t been ruled out as the club continues its search. Deluded? Since when have Ajax and West Ham been remotely comparable in terms of how to play football? Agree Matt, Ajax are always in European competitions where we want to be. He is a proven international, done well so far at Ajax and I thought we were looking for someone progressive. I for one would not be impressed if we ended up with Bilic, not the big name that’s been talked about as the target and less than convinced by his performance in Turkey. Not one of the front runners? As JMan has pointed out his Ajax CV is impressive add that to his running of their academy,assistant manager to a World Cup running up team and a vast wealth of experience playing all over the world. The list must be headed by Clark Kent. Shows a little worrying sign that those inside our club are a little deluded.. Koeman has done crap since he came here from the Dutch league almost getting Southampton relegated. !